Jason Spitz (72) is pulling. This technique is most commonly used by guards. In most playbooks, guards pull for outside runs as a lead blocker, such as a sweep play, and on counter plays, where the far-side guard pulls to block a play-side lineman. Since the guard is free of responsibility for play-side outside runs and far-side counter plays, pulling is generally a unique responsibility for guards. While Tackles can also pull, this strategy is generally less common as they are too far away to pull to the opposite side of the formation (for counter plays) and have the responsibility of blocking the outside defender (generally the defensive end) for outside runs. John Heisman is credited with first pulling guards. Vanderbilt's Dan McGugin soon followed. Pop Warner invented the trap block with his single wing. The offensive line deliberately allows a defensive player to cross the line of scrimmage untouched, and then blocks him with a guard or tackle from the opposite side. 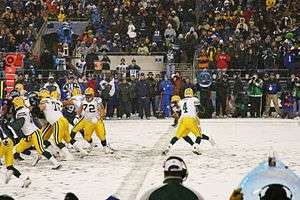 In the 1960s, National Football League (NFL) coach Vince Lombardi of the Green Bay Packers utilized the Packer Sweep play in which guards Jerry Kramer and Fuzzy Thurston rapidly pulled out from their normal positions and led blocking for the running back going around the end. It was an integral part of an offense that won five NFL titles in seven years. ↑ "Football Lingo: What Does Pulling Mean?". ↑ "Hall Names John Heisman". Spartanburg Herald-Journal. May 11, 1978. ↑ Gruver, Ed (1997). "The Lombardi Sweep" (PDF). The Coffin Corner. 19 (5). Retrieved October 28, 2016.